My latest comic western The Fleecing of Fort Griffin is now available in trade paperback and e-book formats through online retailers. Set in 1878 on the West Texas frontier, the novel begins when Baron Jerome Manchester Paget arrives in Fort Griffin with a satchel-full of money intent on starting a buffalo ranch and finding a bride. Swindlers from throughout Texas converge on Fort Griffin to help the rube Englishman “invest” his riches. To realize his buffalo ranching and marital dreams, however, the naïve baron must stay alive in a dangerous frontier town. 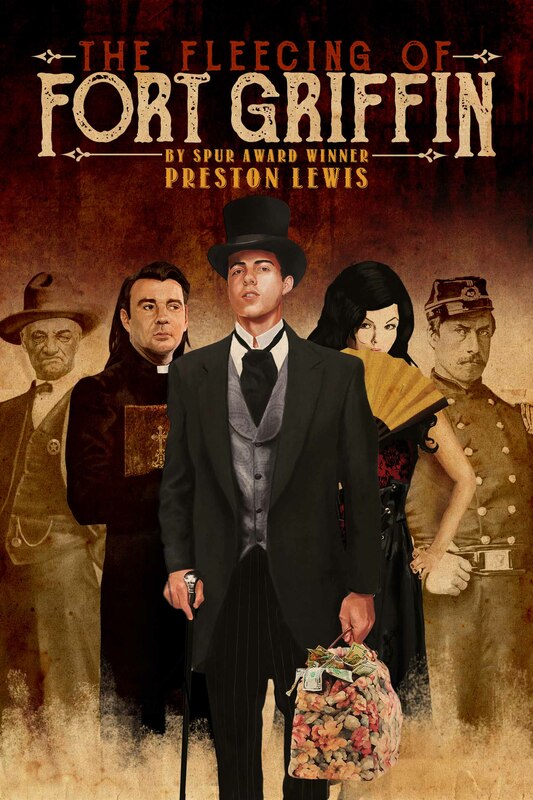 In the book trade, The Fleecing of Fort Griffin is considered a “caper” but I describe it as a western “Sting,” as it takes readers on an comic journey with more twists and turns than a stagecoach trail. Along the way, a bevy of oddball characters, including aging gunfighter One-Eyed Charlie Gatliff, itinerant preacher Rev. G.W. 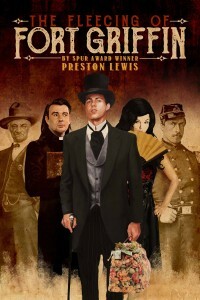 “God Willing” Tuck, black widow Flora Belmont, gambler Joe Loper, virginal harlot Lop-Eared Annie Lea and husband-and-wife con artists Wallace and Amanda Sikes, among others, try to outsmart the naïve baron and each other. Pursued by men who want to kill him and women who want to marry him, the unconventional Baron Jerome Manchester Paget can find only one true friend – 14-year-old orphan Sammy Collins – among all of Fort Griffin’s inhabitants. Collins watches the confluence of con artists with a wide-eyed innocence, dreaming that the baron will one day take him away from his dreary existence in Fort Griffin. Whatever and whenever I’m reading I always look for interesting facts or stories I can work into my novels. Years ago I was reading original frontier papers from Jacksboro and Fort Griffin for background on another project when I read a column by an editor, addressing the great theological questions of the time. The one that caught my attention and brought a laugh was whether a convert’s cork leg must be fully immersed for a Baptist baptism to take. Remembering that story from years ago, I used it in Fleecing when I had Rev. Tuck attempt to baptize Zadocks Crawley and his cork leg with predictable comic results. I set this scene in the Concho River not far from our home in San Angelo. As a nod to my publisher – Wild Horse Press of Fort Worth – I introduce Wallace and Amanda Sikes, who run a honey-pot scam, in a Cowtown hotel. Those are the types of games authors play to amuse themselves when we write. The Fleecing of Fort Griffin is available on Amazon for $19.95 in trade paperback and for $5.99 on Kindle. Wild Horse Press publishes western history and fiction as well as Texana.